Prime factorization: 17 is prime. The exponent of prime number 17 is 1. Adding 1 to that exponent we get (1 + 1) = 2. Therefore 17 has exactly 2 factors. 17 has no square factors that allow its square root to be simplified. √17 ≈ 4.123. How do we know that 17 is a prime number? If 17 were not a prime number, then it would be divisible by at least one prime number less than or equal to √17 ≈ 4.1. Since 17 cannot be divided evenly by 2 or 3, we know that 17 is a prime number. 17 is never a clue in the FIND THE FACTORS puzzles. Many Christmas trees in the United States have been up and decorated for weeks. Some of them have a beautiful angel on the top to remind us of the angel that visited the shepherds. In Hungary, the angel is remembered in a different way. There the Christmas tree is put up on Christmas Eve. Tradition says that angels are the ones who decorate the tree with the delicious candies called szaloncukor. The candies are wrapped in specially prepared white tissue and fastened to the tree with white yarn. See the related articles at the end of the post for more information about this fascinating tradition. The angel puzzles that I’ve made for this post have a few extra clues so they will be easier to solve. The first level 5 puzzle even has many of the same clues as the level 4 puzzle. Nevertheless, be careful because each level 5 angel has a few tricks up her sleeve. Still if you can write the numbers 1 to 12 in both the top row and the first column so that those numbers are the factors of the given clues, then you’ve solved the puzzle. There is only one solution to each puzzle. 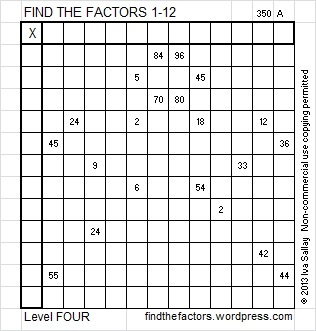 Click 12 Factors 2013-12-19 for a printable version of these and a few other puzzles. Thank you for the printable versions! My kids and I are doing these today to help us recover our mental alertness after the seasonal excesses. You’re welcome! Thank you for printing and sharing the puzzles with your kids. Your writing on your recently freshly-pressed blog is always thought-provoking and demonstrates keen mental alertness. I am delighted to play some small part in keeping you at the top of your game! ha ha! Those are some very cool facts about the number 17. Thanks for sharing them here!